A mom from Canada gave birth to her first child, only to begin a battle for her life. 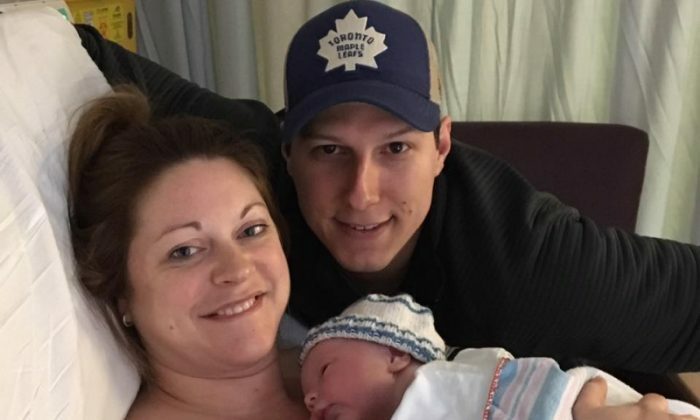 Lindsey Hubley, was a previously healthy woman before she delivered baby Myles on March 2, this year in Halifax, with her fiancé Mike Sampson, CBS News reported. But just four days later, Hubley became extremely ill and was rushed to the hospital. The new mom was diagnosed with necrotizing fasciitis, more widely known as “flesh-eating bacteria” as doctors said her body was going into “severe septic shock,” according to a GoFundMe page set up by her family. After surgery, doctors put her in an induced coma in the intensive care unit where she began suffering multiple organ failures. To keep Hubley alive, doctors performed multiple surgeries, including amputations of both arms and legs below the knee, according to the GoFundMe page. The page asked for $60,000 to help with medical costs, but as of writing on Tue, Oct. 17 they had received over $96,000. But now the mom is taking legal action against the IWK Health Centre and several Halifax-area doctors after claiming that the doctors were negligent in their care during her childbirth and postoperative care. Sampson said his Hubley has still managed to remain upbeat, despite the situation. Hubley is now a quadruple amputee and has been forced to spend the first seven months of her son’s life in the hospital, CTV News reported. Wagner later told CTV that part of the placenta was not removed at birth and that Hubley had a tear that required stitches, which could have contributed to the infection and health issues that followed. In addition, it was alleged that doctors did not perform an examination on Hubley when she returned to the hospital complaining about cramps on March 5, the day after being discharged after giving birth. Instead, they diagnosed her with constipation and sent her home, CTV reported. As stated on heir GoFundMepage, Hubley is now luckily considered “critically stable” as she continues her battle in the intensive care unit. “She has a long journey ahead of her that will include more surgeries, months of rehabilitation, and adjusting to a new way of life for her, Mike, and sweet Myles” they wrote. ‘We are thankful every day that Lindsey is still here and we look forward to the day she can head home to be with both her boys.